Homemade Crepes are perfect for just about any occasion. With a little practice, you can make these easy crepes at home right on your stovetop! 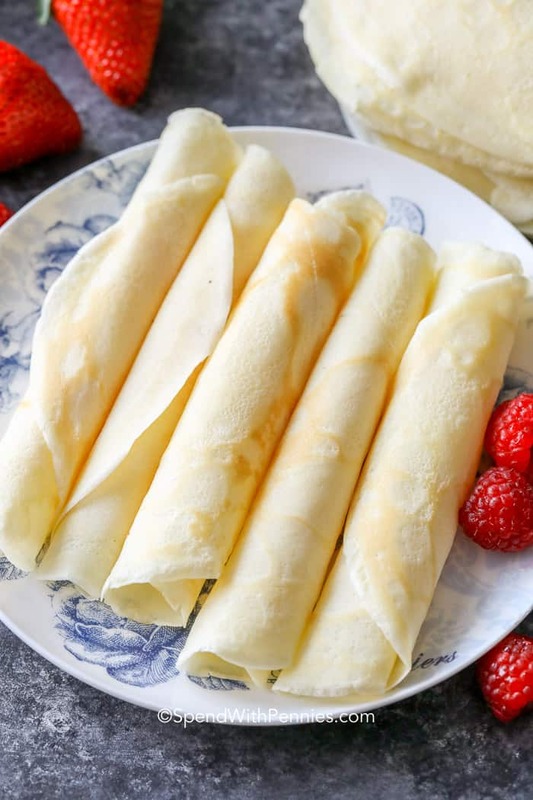 We love serving a good homemade crepe with strawberries and cream cheese, drizzled with Easy Caramel Sauce or creating a savory crepe recipe with some ham, cheddar cheese, and green onions! Whether you have a big brunch planned with breakfast casseroles and mimosas or need a change up from regular pancakes, crepes are always a fun and delicious option. If you’ve ever had French crepes at a restaurant or crepe stand, I am sure you have seen them create crepes with a perfect temperature over a crepe stone and tools made specifically for the job. Fear not, you don’t need a million things to enjoy these delicious, tender, and flavorful delicacies at home! Simply a blender and a frying pan. Crepes are super popular in France. According to Wikipedia, crepes are a type of thin pancake, created with a crepe batter that is thinner than pancake batter. Crepes became popular in 1895 after being mistakenly made by a 14 year old assistant at Monte Carlo Cafe de Paris. They are now served everywhere from street food stalls to fine dining. Crepes can be served with a variety of fillings to suite virtually any taste, from sweet to savory. Find some of the best crepe fillings below. Blend: Create the crepe batter by combining all ingredients in a blender. Crepes are thin, so the blender ensures that no lumps will remain in the crepe batter. Butter: Add a little bit of butter to a 6” skillet and brush it over the skillet to coat over medium heat. Batter: Pour 2 tablespoons of batter into the hot pan. Immediately pick it up and rotate it to coat the skillet with the crepe batter. When making homemade crepes, the trick is in the heat. I had my burner set to 6/10, but it will differ with each stovetop. It may take a crepe or two to get the heat setting right. The crepes should be thin and have a lacy pattern of browning. Crepes do not need to get flipped (although many people do flip them). They are thin enough that they will cook through without flipping. Filling is the fun part, and when we do crepe brunches, I love to set out the various toppings for a ‘make your own crepe’ party. 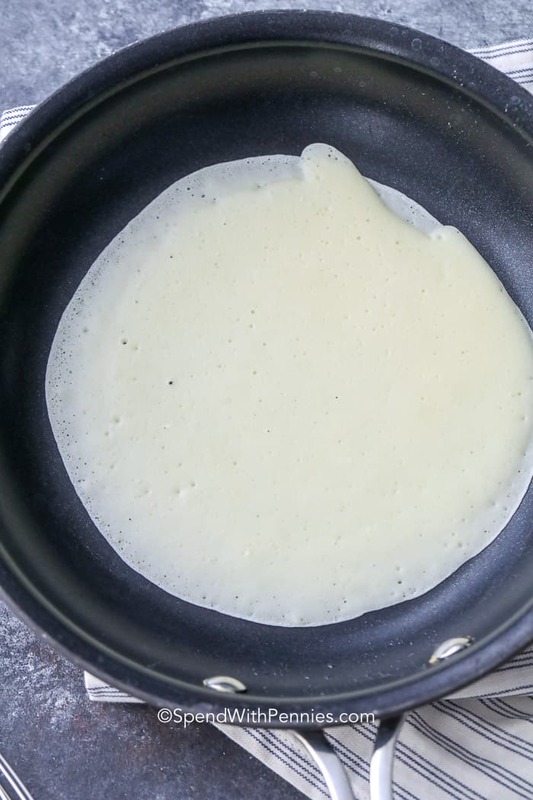 When adding crepe fillings, use a knife to gently spread anything that is spreadable directly onto the crepe, or add the cheese first so it has a chance to melt. 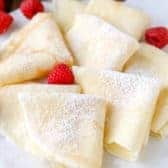 Add the remaining ingredients, then flip it into half twice (quarters), or roll them for yummy crepe rolls! DIY Pancake Mix Recipe – easy! Our Favorite Berry Smoothie – delicious with strawberry crepes! 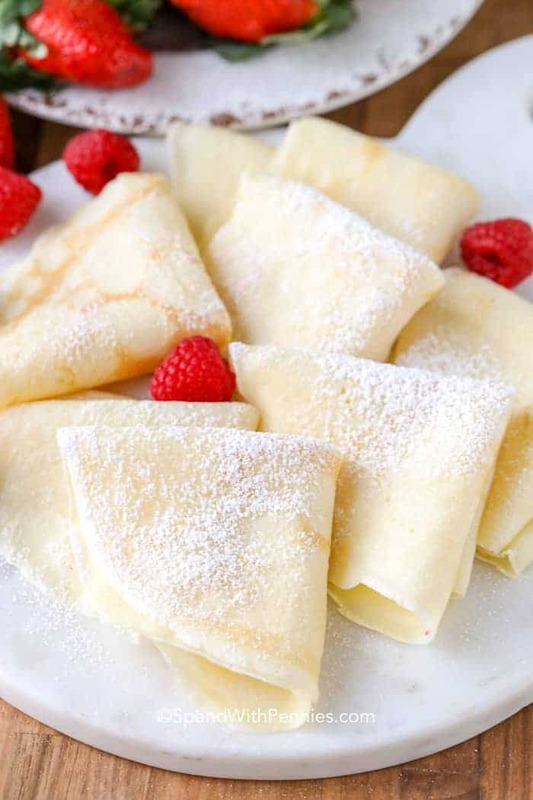 These homemade crepes are perfect for just about any brunch occasion. 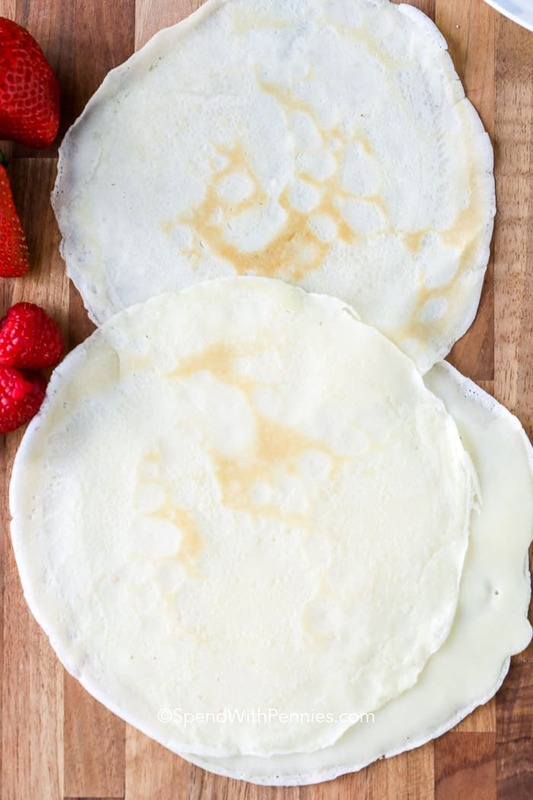 With a little practice, you can make these easy crepes at home right on your stovetop! Combine eggs, add milk, flour, oil sugar and salt in a blender. Add a little oil or butter to a 6 inch skillet with a brush and heat over medium. Pour 2 tablespoons batter into the skillet. Immediately pick the skillet up and rotate it to move the batter to the edges of pan creating a round crepe. Cook until tiny bubbles on the top pop and the crepe is set. Remove and cool on parchment paper.